Written from a real-world perspective by an award-winning copywriter/producer/director, this comprehensive guide is what every writer needs to create powerful, strategic ad copy. 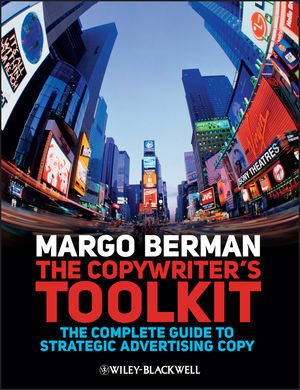 Focusing on strategy, technique, and the skills needed to write for different media, The Copywriter’s Toolkit book will sharpen your copywriting skills whatever your level. Margo Berman is a professor of advertising at Florida International University. She has more than twenty years of experience as an award-winning creative director and copywriter. She is the author of Street-Smart Advertising: How to Win the Battle of the Buzz (2010) and co-author (with Robyn Blakeman) of The Brains Behind Great Ad Campaigns: Creative Collaboration between Copywriters and Art Directors (2009).